Children's Sunday School is from 10:00 - 10:50. During this time your children are well cared for and taught about God and his world. Church Year: The church life is based on the church calendar and we would like the children’s ministry to reflect that as well. One way we will incorporate this is having a large, color-coded calendar (according to the season). Each Sunday a child will move a paper cross to the next Sunday on the calendar to give them a tangible view of the church calendar. Liturgical Life of the Church: Everything that we do in church points us to a big story. We want to help the children unlock this story. Why is the Nave set up the way it is? Why do we receive communion every week? Why do we bow to the cross? Why do some people make the sign of the cross and some don’t? What do all the things on the altar mean? These questions and so many more, are the sorts of questions that we want to help them understand. Book of Common Prayer: The Rector said that saying the prayer book prayers form us and are essential to the development in our faith. We will pick out several prayers from the Prayer Book to memorize and work through. We will focus on each prayer for several weeks. During that time we will explain the meaning and the wording so that they understand what they are praying. Memory Work: Throughout the year we will work on 12 different memory things. This includes the Nicene Creed, The Apostles Creed, several scriptures and much more. Bible: Each child needs to hear how God created all things, including them. He cares so much that even though we have sinned against Him, He has provided a way to have communion with us. We will walk through the stories and show them the Almighty and Everlasting God that we call Father. 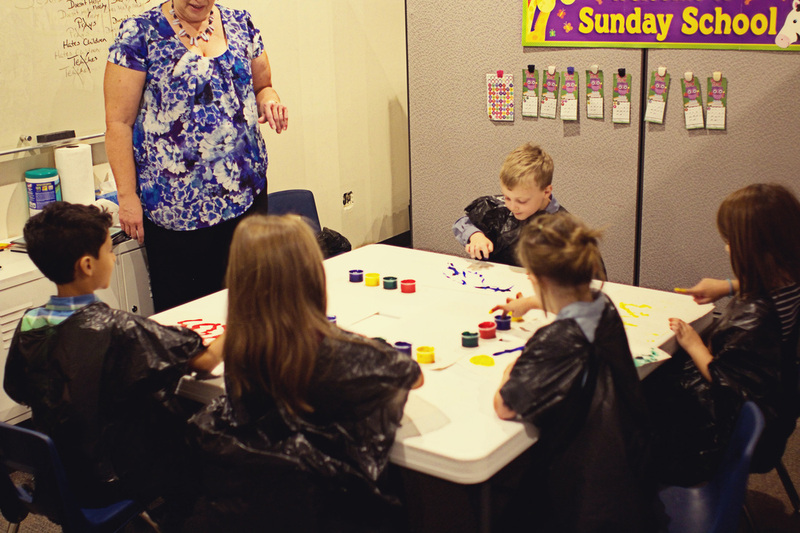 St. George's Children's Ministry Team believes that our children are a vital part of the church and that training them in their faith is of utmost importance. We believe it is our job to cultivate wisdom and virtue in our children and to help them focus on Christ. ​We believe all children are able to embrace the truths of our faith, and thus we believe that our time with them is not a time to entertain but rather a time to stimulate contemplation on God, His world, and His kingdom. 1. Children need to be grounded in the church by participating with the church body. 2. Children need to be led along the Canterbury Trail and taught the meaning and significance behind the many actions and symbols in our Anglican worship. 3. Memory work is essential because during the elementary years children can retain so many things. Their memory work then becomes pegs that they can hang their knowledge on as they dive deeper into things. 4. Children need to take captive every thought. Training their minds to recite preciously memorized Scriptures, prayers, hymns, and creeds is a form of self-discipline that allows them to focus on the true, the good, and the beautiful. 5. We should set our expectations high. When expectations are high, children work harder to meet them. 6. Learning is fun. We do not need gimmicks or fads to engage children. 7. We must dig deep into the truths of the gospel. We are not here to provide feel good lessons. Children need to be confronted with their sin and their desperate need for God. They need to see Christ! 8. When children ask "hard" questions, we need to honor their intelligence and engage with them in the conversation. 9. Activities are a tool to assist in communicating the lesson. They are not the heart of the learning. Therefore, it is acceptable to not finish, or to not even start, an activity if the lesson and discussion require a lot of time.